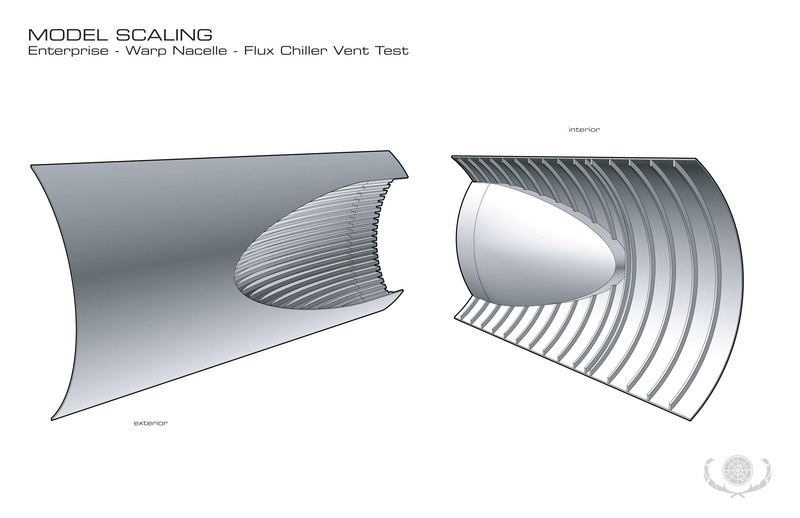 Just a late night update on some 3D modeling I have been doing on some warp nacelle flux chiller grills. I have been focusing the past several weeks, when I can, on working out the very subtle compound curves for the chiller grills. Trying to learn the modeling software in order to generate the right surfaces and subtle arcs that make up these warp engine components and getting them to be shaped properly (and down the millimeter at full scale) has not been as easy as you would think. It also involved doing some more deep-dives into the exact dimensions from the various photos on the web of the original filming miniature. As well as digging into how it was constructed in order to recreate the sub-assemblies in a more precise manner. On that front, I hope to have a discussion with someone who knows exactly how the model was made. I connected with Richard Taylor, the art director for Star Trek: The Motion Picture via social media, and he was very generous in agreeing to have a phone conversation to go over the down-in-the-weeds aspects of his warp engine design work (which he personally did). I am very excited to talk to him next week, which should hopefully help solve many of the open questions on how the model was built, so that hyper accurate cross section drawings can be generated. More on that when the conversation takes place. And for any of you fellow modelers and/or Trekkers out there, who might have a boring question about the filming miniature of the USS Enterprise as seen in the first Star Trek movie, shoot me a message and I will see if I can ask him. This entry was posted in Project Enterprise, Projects and tagged 3D modeling, MoI, Richard Taylor, warp engine, warp grill. Bookmark the permalink. I saw a diagram Probert did that showed the curve on the upper half of the primary hill disk to be a radius of 4′. That implies the thickness of the hill disk is more than 20′ that Probert assumed when sketching out the rec Dec. Does Richard have any nitty gritty details on dimensions the filming model had, or was it kinda loose and based on what looked good? I have not done a serious study of the saucer section yet, though did run up a hull thickness comparison this evening about the subject you bring up regarding the top edge radius given in one of the Ad Astra production illustrations done by Andrew Probert. Ack. I meant to type Astra Image (not Ad Astra) which was the art department sub-company at Robert Able & Associates which was especially created for the production of Star Trek: The Motion Picture which was closely cooperating with Paramount’s studio model shop, Magicam – legally sub-contracted by ASTRA for the build of the studio models. For what it’s worth, another drawing by Probert showed the hull thickness as being 9″ (at least as measured in the ceiling of the Officer’s Lounge. I am not 100% sure I have the image/sketch you are referring to (would love to see which of Mr. Probert’s sketches you are referencing). I was a little inaccurate in referring to “hull thickness” in this post however. As it is actually about the external radius of the saucer section at the rim of saucer decks 6 and 7, and not the thickness of the hull materials itself. I have been doing some research on the actual theoretical layer/material thickness for the hull/skin thickness, which is accounted for in the nacelle modeling. I hope to eventual draw up final composition diagrams on that as inset illustrations in the final nacelle drawings (once I get there).